New layout, new style of posts, even a new name. It’s all an attempt to get inspired again about having a food blog. I know I haven’t posted since August and honestly, it’s because I was a little frustrated. I’m about as amateur as you can get, which is okay because it’s about learning and enjoying the experience. But when you’re trying to take photos for your blog and are finding natural lighting and good quality photos impossible, you get discouraged. I don’t have photoshop, a special niche, or a cool theme. I don’t create my own recipes or possess remarkable presentation skills. I’ve never catered a party or baked for anyone besides my family and friends. So I felt like this blog, even if the photos were decent and the recipes were good, would never get noticed. But hopefully that shouldn’t matter to me. I like to bake. I love to bake. It’s the most relaxing, soothing, enjoyable hobby I’ve ever had, even if I’m not an expert. So I’m going to continue this blog and if anyone besides me benefits from it, all the more better! :) That said, it’s great to start blogging again. Phew! Thanks for staying with me. Maybe you’re just sticking around for the recipe. When I began to follow food blogs, one of the things that surprised me most was the absolute hate that Martha Stewart gets. I don’t care for her much as a person, but her recipes are always reliable and well worth the effort for me. My dad knows a new Martha Stewart cookbook is the best way to make me smile. I can’t help it, I trust her! This cake was no exception. Moist, flavorful, and best of all, light! The texture was great and it was the perfect sweetness. Officially the best carrot cake I’ve ever had. Butter and flour two 8 or 9 inch pans and preheat the oven to 300 degrees. Chop the pecans finely and grate the carrots, about 2 1/2 cups total. You can use a food processor when you’re in a hurry, but I find grating them by hand (using the smallest holes) gives a lighter and definitely better texture. Whisk the carrots, eggs, buttermilk, vanilla, sugar, vegetable oil, and ginger in a large bowl until well combined. In another bowl, whisk together the flour, baking powder, baking soda, salt, and cinnamon. Use a rubber spatula to gently fold the flour mixture into the carrot mixture, taking care not to over-mix. Fold in the pecans. Divide the batter into the two pans and bake about an hour, until a toothpick comes out clean. Let the cakes cool 15 minutes in their pans on a rack, then gently turn out and cool to room temperature before leveling and frosting. * It isn’t vital to toast the pecans, but does add something: arrange the pecans in a single layer on an ungreased baking sheet and toast in a 375 degree oven until golden, about seven minutes. Beat cream cheese and butter with the paddle attachment of an electric mixer until smooth, then add powdered sugar. Mix on low for 30 seconds, then add ginger and orange juice. Beat on medium speed until light, fluffy, and well combined. Assembly: Unless your cakes are pretty flat or you’re going for a rustic look, use a serrated knife to level each cake. Spread 3/4 cup frosting between the layers and use the remaining frosting on all the sides and the top. If you wanted, you could cut each layer in half horizontally for a four layer cake, using less frosting between layers. Cake decorating is a definite weak area for me, I can never get it smooth! 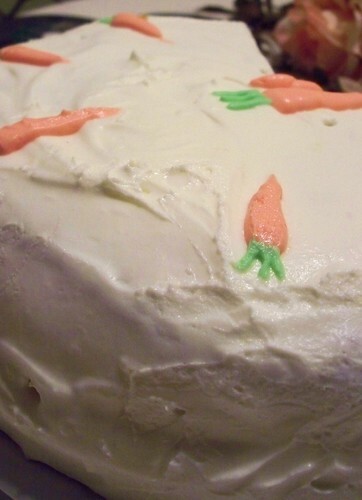 I used food coloring to tint the leftover frosting green and orange and used a plastic ziplock bag to pipe carrots. My mom and I ate the whole thing. Yum. Entry filed under: Cake/Cupcakes. 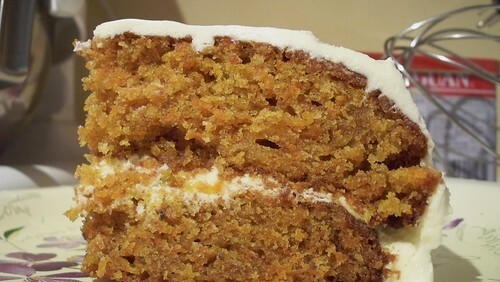 Tags: cake, carrots, cinnamon, cream cheese, ginger, layer cake. I feel the same way about my blog too! I came to about the same conclusion that you did. Whether or not people comment on my posts, I enjoy writing about the food that I make so I’m going to keep doing it. And now I’m going to add you to my reader. :) So I notice! You have to bake for you and do what you enjoy. Someone willl appreciate what you have to offer and visit your site because of it. I think you’re doing a wonderful job and I love what I see so far! And I attempted replacing pecans with walnuts! Any advice? Oh, and not having cream cheese, I omitted the frosting. Anything I could use to replace cream cheese? ~ But I tasted the dough, and YUM. It’s in the oven right now! This is so weird! I just starting reading your blog yesterday. (btw you inspired me to create my own blog today) But I completely made this exact cake from Martha Stewart last week for my friend’s mom. Tomorrow, I’m going to make it in a bread pan to see if it’s better that way! 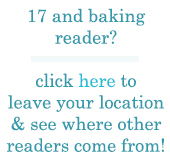 Reading this really cheered me up, I recently restarted my own baking blog and its really hard when I didn’t even own my own camera at the start and even now I only have a cheapo compact, no photoshop, almost no baking equipment beyond a couple of cake tins and an electric whisk circa 1990. Ah, it sounds a horrible thing to say that I’m comforted to hear even you sturggled at the start, but I’m sure you know what I mean. I’m a new reader and reading through from the beginning here. I just want to encourage you – I think you’re doing a fantastic job!